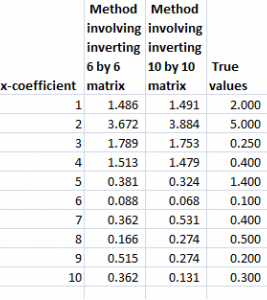 Top Forecasting Institutions and Researchers According to IDEAS! 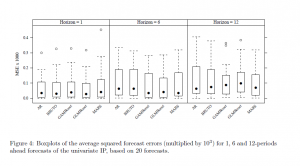 Here is a real goldmine of research on forecasting. IDEAS! is a RePEc service hosted by the Research Division of the Federal Reserve Bank of St. Louis. 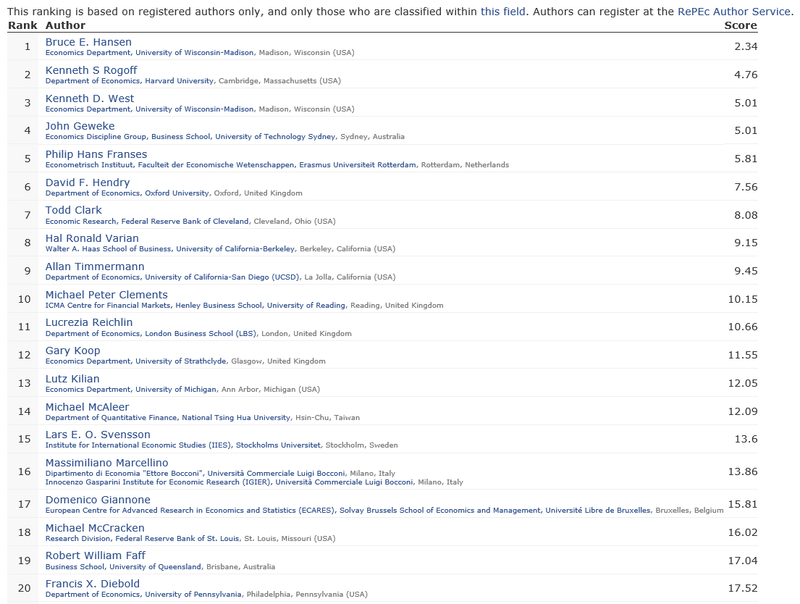 This website compiles rankings on authors who have registered with the RePEc Author Service, institutions listed on EDIRC, bibliographic data collected by RePEc, citation analysis performed by CitEc and popularity data compiled by LogEc – under the category of forecasting. Here is a list of the top fifteen of the top 10% institutions in the field of forecasting, according to IDEAS!. 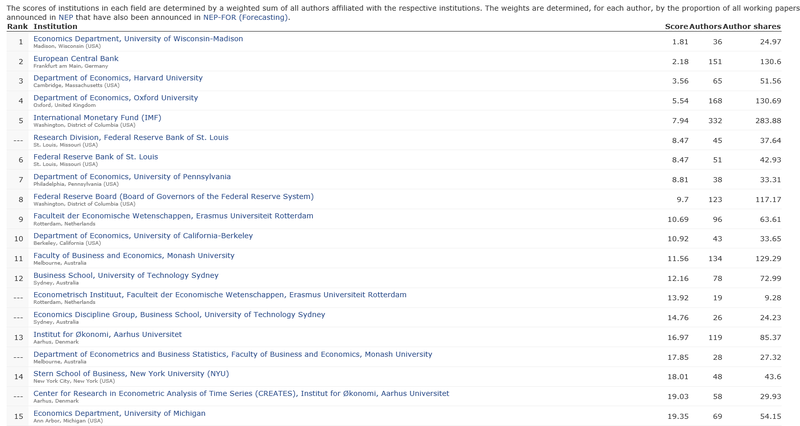 The institutions are scored based on a weighted sum of all authors affiliated with the respective institutions (click to enlarge). 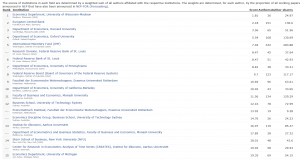 The Economics Department of the University of Wisconsin, the #1 institution, lists 36 researchers who claim affiliation and whose papers are listed under the category forecasting in IDEAS!. The same IDEAS! Webpage also lists the top 10% authors in the field of forecasting. I extract the top 20 of this list here below. 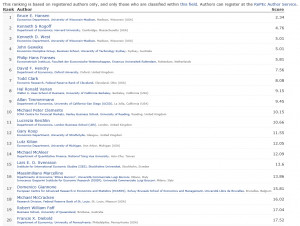 If you click through on an author, you can see their list of publications, many of which often are available as PDF downloads. This is a good place to start in updating your knowledge and understanding of current thinking and contextual issues relating to forecasting. 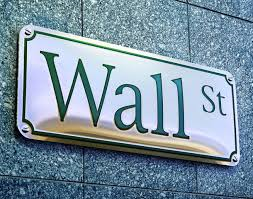 For an applied forecasting perspective, there is Bloomberg with this fairly recent video on several top economic forecasters providing services to business and investors. I believe Bloomberg will release extensive, updated lists of top forecasters by country, based on a two year perspective, in a few weeks. If you learned your statistical technique more than ten years ago, consider it necessary to learn a whole bunch of new methods. Boosting is certainly one of these. 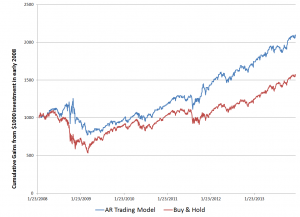 Let me pick a leading edge of this literature here – boosting time series predictions. Let’s go directly to the performance improvements. 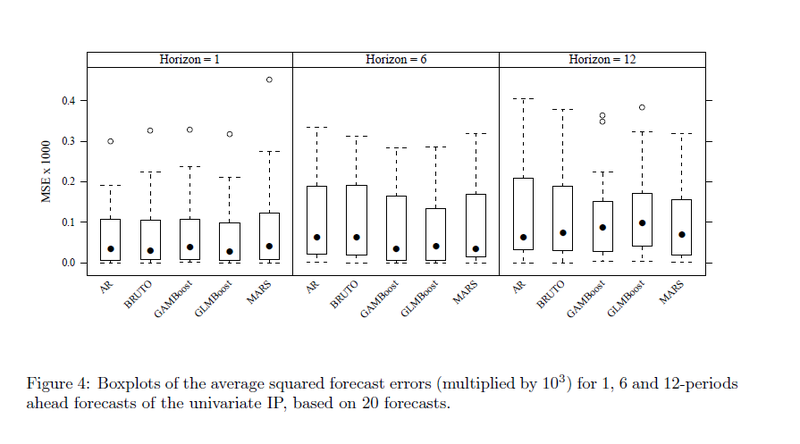 The three columns refer to three methods for generating forecasts over horizons of 1-18 periods (M3 Competition and 1-56 period (Neural Network Competition). 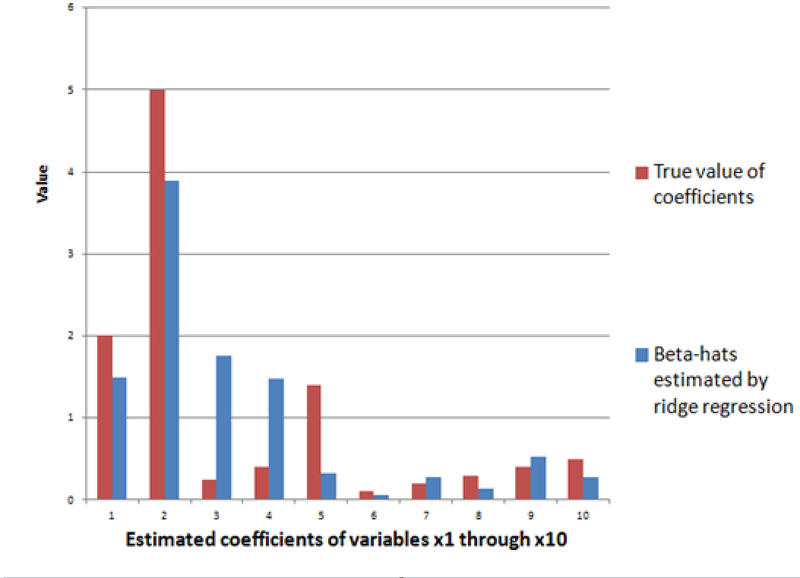 The column labeled BOOST is, as its name suggests, the error metric for a boosted time series prediction. 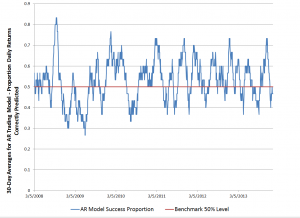 Either by the lowest symmetric mean absolute percentage error or a rank criterion, BOOST usually outperforms forecasts produced recursively from an autoregressive (AR) model, or forecasts from an AR model directly mapped onto the different forecast horizons. 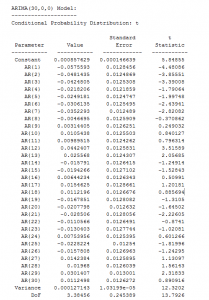 The M3 competition dataset consists of 3003 monthly, quarterly, and annual time series. The time series of the M3 competition have a variety of features. Some have a seasonal component, some possess a trend, and some are just fluctuating around some level. The length of the time series ranges between 14 and 126. We have considered time series with a range of lengths between T = 117 and T = 126. 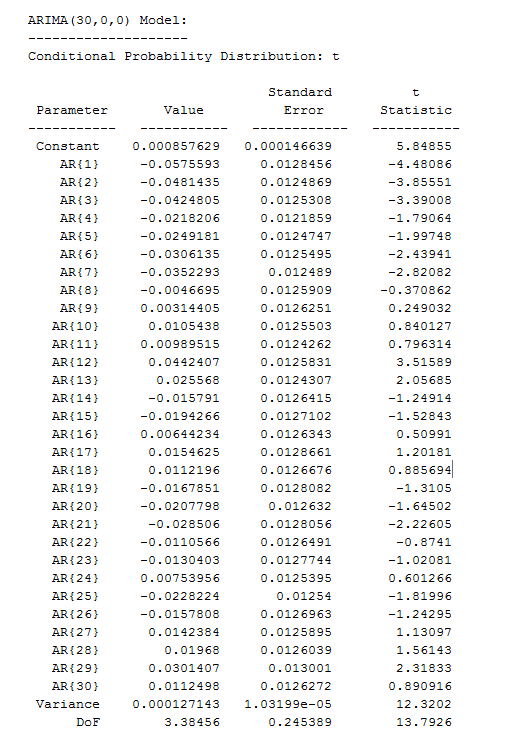 So, the number of considered time series turns out to be M = 339. 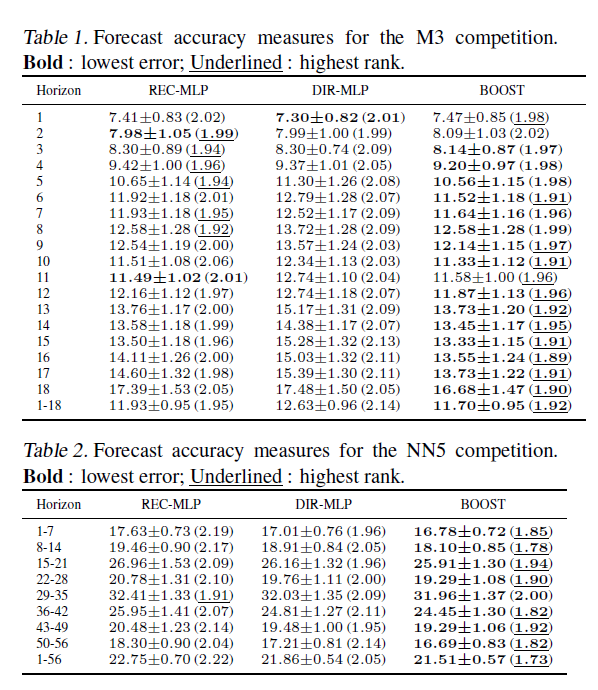 For these time series, the competition required forecasts for the next H = 18 months, using the given historical data. The NN5 competition dataset comprises M = 111 time series representing roughly two years of daily cash withdrawals (T = 735 observations) at ATM machines at one of the various cities in the UK. For each time series, the competition required to forecast the values of the next H = 56 days (8 weeks), using the given historical data. 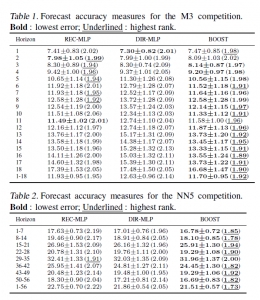 This research, notice of which can be downloaded from Rob Hyndman’s site, builds on the methodology of Ben Taieb and Hyndman’s recent paper in the International Journal of Forecasting A gradient boosting approach to the Kaggle load forecasting competition. 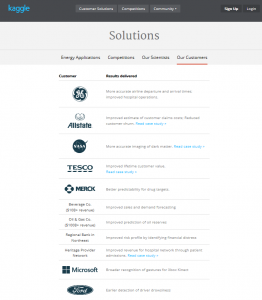 Ben Taieb and Hyndman’s submission came in 5th out of 105 participating teams in this Kaggle electric load forecasting competition, and used boosting algorithms. Let me mention a third application of boosting to time series, this one from Germany. So we have Robinzonov, Tutz, and Hothorn’s Boosting Techniques for Nonlinear Time Series Models (Technical Report Number 075, 2010 Department of Statistics University of Munich) which focuses on several synthetic time series and predictions of German industrial production. 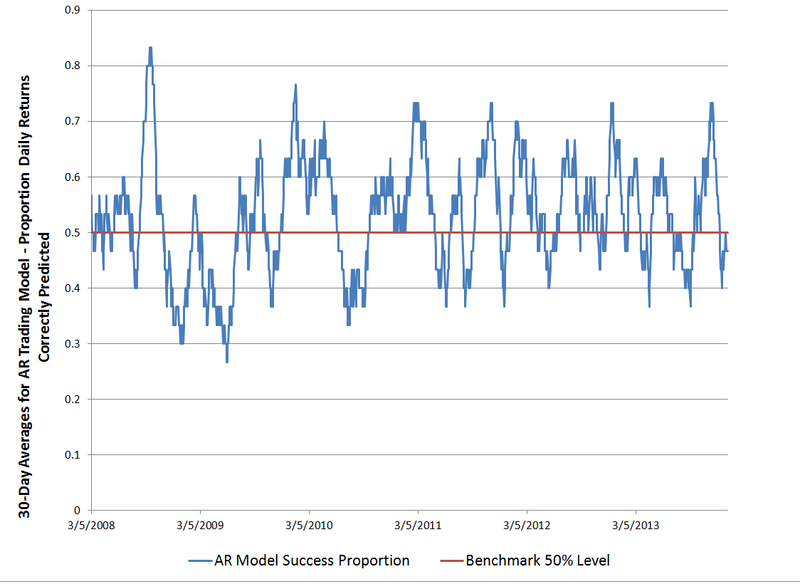 Again, boosted time series models comes out well in comparisons. GLMBoost or GAMBoost are quite competitive at these three forecast horizons for German industrial production. My presentation here is a little “black box” in exposition, because boosting is, indeed, mathematically intricate, although it can be explained fairly easily at a very general level. Weak predictors and weak learners play an important role in bagging and boosting –techniques which are only now making their way into forecasting and business analytics, although the machine learning community has been discussing them for more than two decades. In an early paper, Kearns and Valiant proposed the notion of a weak learning algorithm which need only achieve some error rate bounded away from 1/2 and posed the question of whether weak and strong learning are equivalent for efficient (polynomial time) learning algorithms. 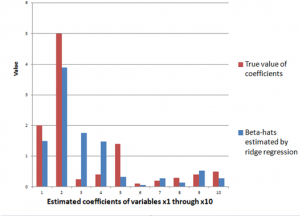 Boosting algorithms are procedures that “boost” low-accuracy weak learning algorithms to achieve arbitrarily high accuracy. And a weak learner is a learning method that achieves only slightly better than chance correct classification of binary outcomes or labeling. This sounds like the best thing since sliced bread. For example, boosting can be understood as a functional gradient descent algorithm. So worth the twenty bucks or so for the download. The papers discussed above vis a vis boosting time series apply p-splines in an effort to estimate nonlinear effects in time series. This is really unfamiliar to most of us in the conventional econometrics and forecasting communities, so we have to start conceptualizing stuff like “knots” and component-wise fitting algortihms. Fortunately, there is a canned package for doing a lot of the grunt work in R, called mboost. 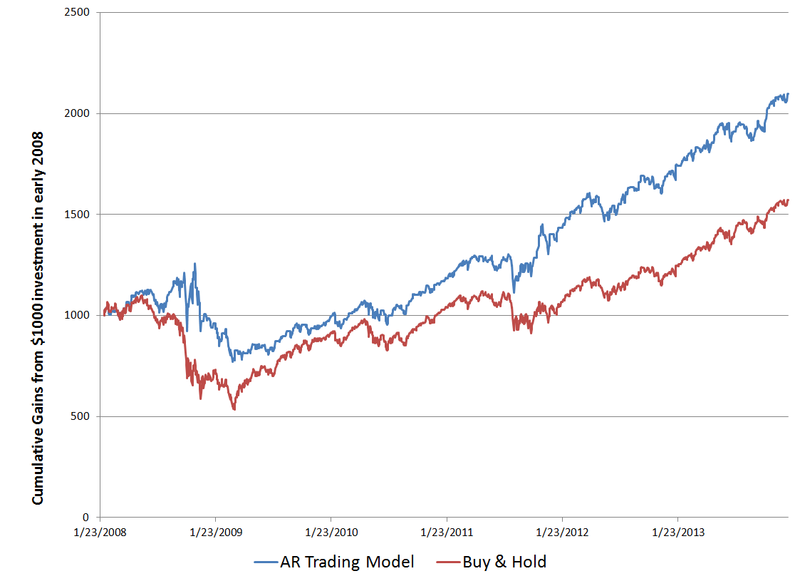 Bottom line, I really don’t think time series analysis will ever be the same. Kaggle is evolving in industry-specific directions, although it still hosts general data and predictive analytics contests. Oil and gas, which for Kaggle means mostly fracking wells in the United States, have well-defined data sets and a clear need to find working wells. While the data used in traditional oil drilling is understood, fracking is a somewhat different process. Variables like how long deep rocks have been cooked in the earth may matter. So does which teams are working the fields, meaning early-stage proprietary knowledge is also in play. That makes it a good field to go into and standardize. focusing on building new kinds of software that could better learn about the data it was crunching and offer its human owners insights on any subject. A year or so ago, the company evolved into a service-provider with the objective of linking companies, top competitors and analytical talent, and the more than 100,000 data scientists who compete on its platform. 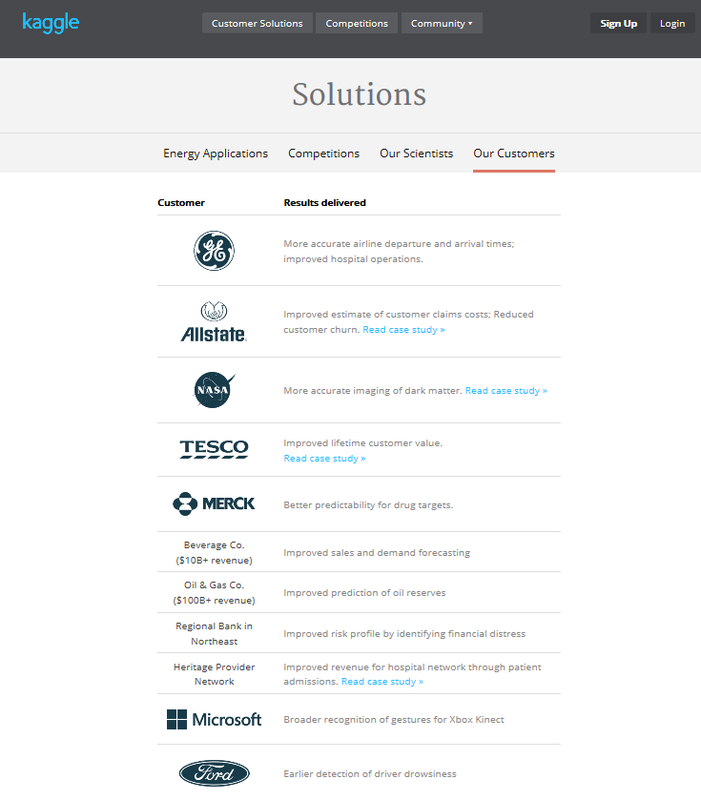 So Kaggle now features CUSTOMER SOLUTIONS ahead of COMPETITIONS at the head of its homepage, saying We’re the global leader in solving business challenges through predictive analytics. The homepage also features logos from Facebook GE, MasterCard, and NASA, as well as a link Compete as a data scientist for fortune, fame and fun ». But a look at the competitions underway currently highlight the fact that just a few pay a prize now. 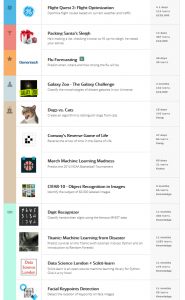 Here is a selection of Kaggle Solutions. This video gives you a good idea of the current focus of the company. This is a big development in a way, and supports those who point to the need for industry-specific knowledge and experience to do a good job of data analytics.